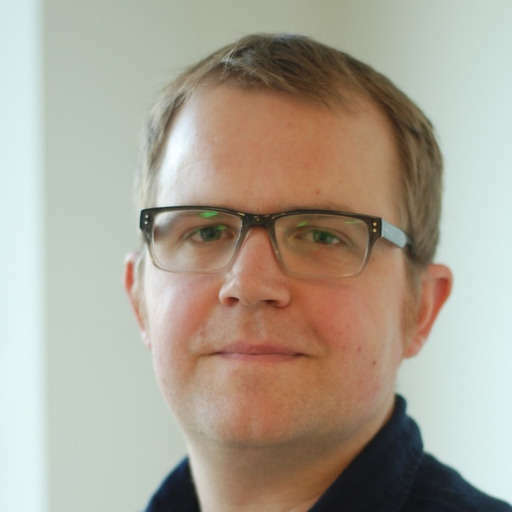 My name is Eddie, and I'm the Head of Design in MOJ Digital. I joined in April 2013, only a few months after the digital team was formed. Our staff hail from a wide range of backgrounds, both in terms of country of origin and previous work experience. Many of us previously worked for the private sector, in multinational corporations as well as for a variety of smaller agencies. There are currently 9 people in the design team, including designers from South Korea, Turkey, North America, Australia as well as the UK. We’ve worked at places including Nokia, Sky, Intel, BERG and other design agencies. Our team is made up of UX (User Experience), interaction and service designers, and most of us have visual design skills too. We all joined the team because we wanted to work on services that would have a positive effect on the lives of real people. 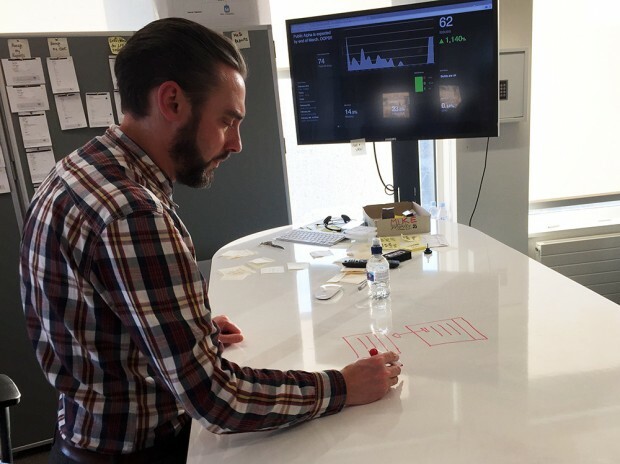 One of our designers, Tom Norman, sketches on a whiteboard desk. We’re now looking for more designers to help us create world-class services that we can be proud of. Our work involves transforming large and complex services, used in multiple ways by millions of people every day. As a designer you will have the challenge of handling everything from the complex big picture down to the fine details of an interface, while always thinking about the experience of the user. If you’re a good team player and like to meet new people, you will be right in your comfort zone as you’ll have the chance to meet numerous stakeholders and members of the public, and work in a team with researchers, developers, other designers, and product and delivery managers. 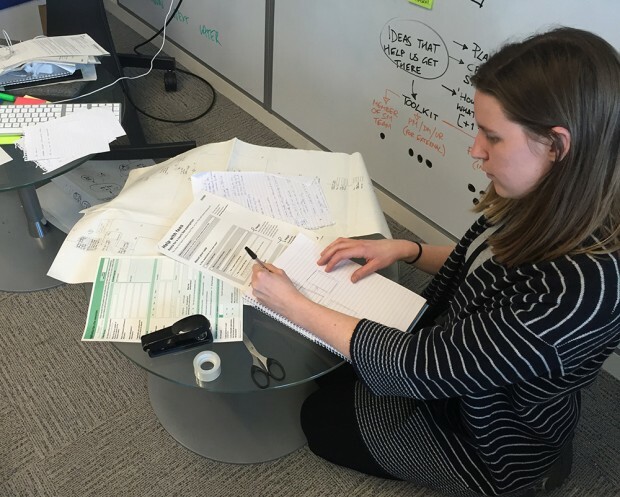 Kellie Matheson, another of our designers, working on a service that requires new paper forms, as not all of our work is digital. We're always coming up with new insights, and challenging assumptions and testing ideas is very much a part of the day-to-day job. We’re not just about making things look 'pretty' or designing what a stakeholder thinks they need - we translate user needs into solutions and test how well they meet those needs. This insight is then fed into the next week's or fortnight's work, or into a backlog for later on. A designer will form a close partnership with a user researcher, a content designer and a front-end developer for a given digital service, and together they will own the overall user experience for the project and ensure quality is maintained throughout. Our designers should be able to create enough of a prototype to help the wider team learn about user needs for a given scenario or task. This could take the form of a rough sketch, an interactive mock-up or a coded prototype. We refine our prototypes based on research with users to test design assumptions, and move to work with real code in a browser as early as possible. What I can promise you if you do end up joining our team is a whole host of interesting projects - the kind you’d be very unlikely to get to work on elsewhere. 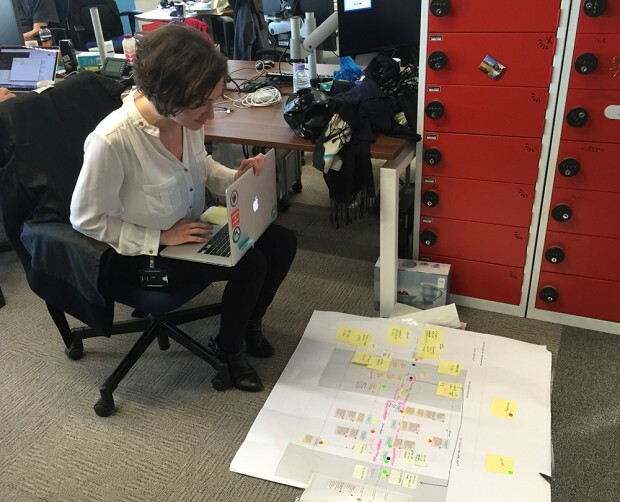 Very often it helps us to create user journey maps and process flows to understand the scope of the service. Here one of our designers, Asli Ozpehlivan, is tweaking a user journey map based on feedback. If you’re interested in joining our team, would like to find out more or know someone who would be great for the role - please get in touch. You can apply online or email contact-us@digital.justice.gov.uk or recruitment@digital.justice.gov.uk if you need more info about the role. A lot is going on in the team at the moment, so make sure you follow us on Twitter @MOJDigital so you don't miss out.